Can I persuade you to jump into a jumpsuit? Not so long ago, I could never have imagined wearing a jumpsuit but I guess that’s partly because I hadn’t found the right one. A very short, very tight, Ted Baker style one (lovely as they are) worn with heels for a night out would have just caused looks of consternation wherever I went. It’s a bit like the off-the-shoulder top that I tried on the other day. What looked like a 19 year old’s top next to the face of a 44 year old. Not so much. However just after Christmas I took the plunge and ordered the Baukjen playsuit that I’m wearing above. I didn’t expect to like it but I was pleasantly surprised not only by its comfort and quality but also because of its laid back style. Whilst I couldn’t deal with a jumpsuit in a dressed up environment I can get my head around it in a more relaxed setting, with flats and a stack of friendship bracelets. The drawstring waist means that I can alter the length of the shorts, the addition of a sleeve means that I feel less exposed and the neckline is one that I like. As with my denim Topshop jumpsuit that I’ve worn so much, an all in one outfit just takes the hassle out of dressing. 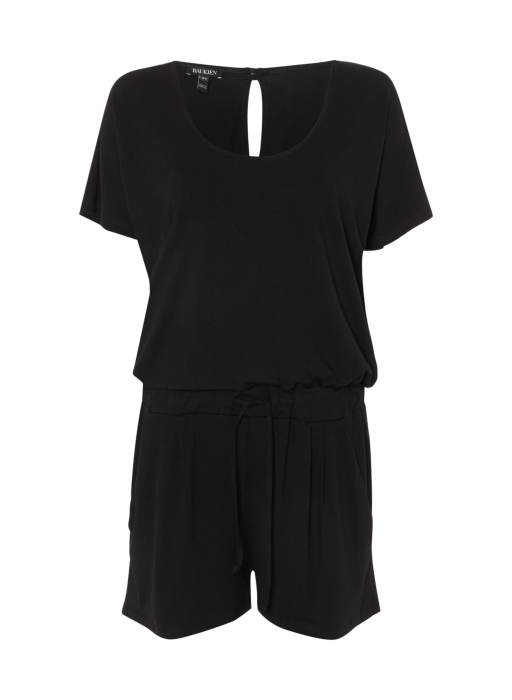 This Baukjen playsuit (£71) is a good alternative, although sizes are limited. 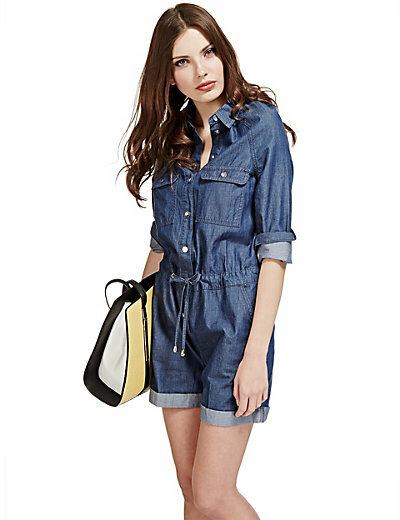 And M&S Limited Edition has this playsuit (£45) which I love for its denim look, although the reviews about its fit aren’t great – but obviously one size doesn’t fit all and I would personally still give it a try. In fact M&S has quite a good selection of jumpsuits, both printed and plain so it’s worth taking a look there as a starting point. GAP has this tencel playsuit (24.99) which would be perfect for those who might prefer a little less coverage, possibly because they’re going somewhere other than wet Wales or rainy Guernsey for their hols! I know that some of us may be over 40 and that some of us will soon be teetering on the brink of being nearer to 50 than 40 – but that doesn’t mean that we have to resign ourselves to wearing mid calf, wide leg, flippy, flappy linen trousers in the summer. Previous Post A second outfit for when it’s (still) hot in the city…. Next Post Sharing a couple of new pink acquisitions…. Hi Alex, that's so kind of you – thank you. I always read comments with a certain amount of trepidation!! The sandals are from Miss KG. I don't think that they are leather but they are really well shaped to the foot and soooo comfortable. Probably in the sale now too! I too bought the same Baujken playsuit in January…and wore it for the first time last week…and love it! I was very apprehensive at first, but the colour, length of the shorts (not too short!) sleeves and great quality jersey fabric means it's perfectly appropriate for us 45+ women (scarily I am now near to 50 than 40…as of this year). Hi Carol – I couldn't agree more, I think that Baukjen got this one just right for us, as you delicately say, 45+ women! I've recently become a playsuit convert. I invested cautiously in a denim one from New Look – shirt top for coverage and modest (yet not mumsy) short length. I agree it feels great styled in a laid back way with flats and casual jewellery and is oh so comfortable and practical for running around a park with a toddler. Hi Laura Jane – thank you for dropping by. I love the term "cautious investment" – it encapsulates perfectly the way forward with things that we're not too sure will work. Love the sound of your New Look one and as you say, perfect for the park with a toddler in tow.